This calorie packed hardgainer smoothie recipe is the ideal breakfast or post-workout meal that will fit perfectly into you hardgainer diet plan. If you are a hardgainer that struggles to put on size you need to be packing in quality calories at every meal. Have this delicious, calorie-packed hardgainer smoothie for breakfast or after training to help you build bigger, stronger muscle mass. This mega-muscle smoothie packs a massive 1000 calories in every serve. Combine all hardgainer smoothie ingredients in a blender and mix until smooth. Enjoy your hardgainer smmothie as a calorie packed breakfast or post-workout muscle building protein shake. Hardgainers should choose calorie dense foods that are rich in nutrients, combining carbohydrates, protein and good fats. Oats are a staple hardgainer food that give you energy to power through your training. Oats are a complex carbohydrate that have a low GI, meaning a long lasting supply of fuel. Oats as a hardgainer diet food are also low in fat, high in fiber and contain essential vitamins and minerals for building muscle mass. 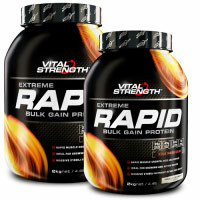 Vitalstrength Extreme Rapid Protein is the ideal protein protein powder for your hardgainer diet. 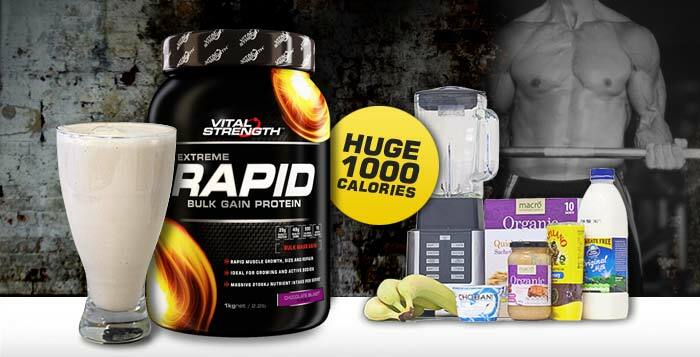 As well as the optimum nutritional content the amino acid profile of Vitalstrength Rapid is particularly suited to a hardgainer diet with added glutamine and creatine to help minimise muscle breakdown and increase size gains. Peanut butter is an essential hardgainer diet food that is calorie dense, packed with protein, fibre and good fats and is great source of energy to help regulate your appetite by stabilising blood-sugar levels. Bananas are the best fruit to include in your hardgainer diet as they supply sustained energy to your muscles and are packed with quality calories. Bananas also contain B vitamins for muscle energy while also helping to restore potassium levels to rehydrate cells after a workout. Milk has been a bodybuilding and hardgainer staple for years. One cup of whole milk provides 150 additional calories. Milk is also vitamin rich and contains highly digestible proteins, such as casein and whey to help grow your muscles. Yoghurt combines an ideal mix of protein, carbs and calcium for mass gains in your hardgainer diet. Yoghurt is also rich in vitamin B12 and supplies your body amino acids for muscle energy and growth. One tablespoon of flaxseed contains around 1.5g of omega 3 fatty acids. These essential fats lock protein into your muscle fibres and help to boost your metabolism.